Trying to stretch your $1 as far as possible. 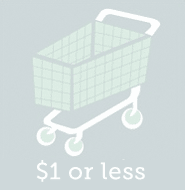 Use this week’s $1 or Less list of deals to really get the most for your money! Earn 10¢ Fuelperks WYB (2) participating items. Earn 15¢ Fuelperks WYB $10 of participating items.